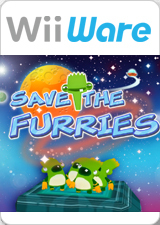 Help Save the Furries across 60 levels in this puzzle-adventure! Furries are cute green creatures that like to visit strange planets and then stroll about oblivious to the dangers around them. Where you are needed is to use the Wii Remote to move and swipe pinballs, ropes, logs, crates, carts, switches, fans and all sorts of other items to help create a safe path to the exit. Make sure you keep the Furries safe from strange galactic creatures, spikey pits, huge explosions, giant drops and becoming the main dinner of the evil Furax! The graph below charts the compatibility with Save the Furries since Dolphin's 2.0 release, listing revisions only where a compatibility change occurred. This page was last edited on 15 January 2018, at 03:02.